This article is about the U.S.-based Sinaloa-style marinated grilled chicken restaurant chain. For the Mexico-based Sinaloa-style marinated grilled chicken restaurant chain, see El Pollo Loco (Mexico). El Pollo Loco, Inc. is a restaurant chain based in the United States, specializing in Mexican-style grilled chicken. Restaurant service consists of: dine-in, take-out, with some locations offering drive through options. The company is headquartered in Costa Mesa, California and operates about 500 (as of January 2019) company-owned and franchised restaurants in the Southwestern United States. El Pollo Loco primarily prepares Mexican chicken entrees. The company describes its chicken as "citrus-marinated and fire-grilled." The American company also offer Mexican-style food such as tacos, burritos, enchiladas, and quesadillas. In a bid to compete with companies such as KFC and Chick-fil-A, El Pollo Loco experimented with offering deep fried chicken in the form of breaded chicken tenders at selected locations in the United States for a limited time during the Fall 2016. This experiment is a big departure from its previous marketing campaigns that tout their fired-grilled chicken as a healthy alternative to fried chicken. Juan Francisco Ochoa started the restaurant in Guasave, Sinaloa, Mexico, in 1975. By 1979 the chain had expanded throughout northern Mexico. On December 8, 1980, Ochoa opened his first U.S. restaurant in Los Angeles, California at 503 Alvarado Street, near Sixth Street. The first American location was only 1,500 square feet (140 m2) and it grossed more than $125,000 per month during its first year of operation. The initial menu was very simple: a choice of a half or whole chicken with a packet of warm tortillas and a cup of salsa. A second location was opened in Santa Ana in the fall of 1981. In 1983, the 19 American restaurants in the chain were acquired by Denny's with an agreement that the Ochoa family would continue to operate the restaurants in Mexico under the corporate name El Pollo Loco, S.A. de C.V. where it continue to operates. After 18 months of new ownership, the American owned El Loco Pollo, Inc. had increased the number of locations in Southern California from 19 to 29 while adding 6 locations in distant Houston, Texas, with almost all of the new locations were franchise operations. Four years later the 70-unit El Pollo Loco was acquired by TW Services when TW Services purchased El Pollo Loco's then parent Denny's Inc. in 1987 for $218 million in cash. In May 1990, El Pollo Loco opened its 200th restaurant. That new restaurant was located in Yorba Linda, California. During the early 1990s the company experimented with many different concepts to increase marketshare in the competitive Southern Californian fast food industry. In 1994 the company test marketed at a select few locations: a side-dish bar, salsa bar, and barbecue at some locations, while other locations tried selling french fries or ice cream. Only salsa bars survived the test and were introduced chainwide the following year. The company also tested home delivery and catering in 1995. In August 1995, El Pollo Loco earned a place in the Guinness Book of World Records for building the world's largest burrito in Anaheim, California. The burrito was 3,112 feet (949 m) long and weighed two tons. In December 1995, John A. Romandetti replaced Raymond J. Perry as president and chief executive officer. Sixteen months later, Romandetti was replaced by Nelson J. Marchioli as president and chief executive officer in April 1997 when Romandetti was transferred to sister company Denny's as its new CEO. American Securities Capital Partners acquired the 274-location El Pollo Loco in 1999 for $114 Million from Advantica (formerly called TW Services) and later sold it to Trimaran Capital Partners in 2005 for $400 Million with 328 locations. In April 2001, Stephen Carley replaced Nelson J. Marchioli as president and chief executive officer. Marchioli left EPL, Inc., to head its former parent company Advantica. In January 2007, El Pollo Loco was featured on NBC TV's hit show The Apprentice: Los Angeles where contestants competed by creating and selling versions of El Pollo Loco's Pollo Bowl. 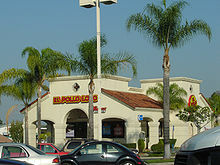 El Pollo Loco was recognized by the World Franchising Network as a Top Franchise for Hispanics in 2010. New locations were first open by franchisees in the states of Utah and Oregon in 2008. The 400th location was opened in Chelsea, Massachusetts in May 2008. In August 2010, president and chief executive officer Steve Carley unexpectedly resigned to head Red Robin Gourmet Burgers. In January 2011, Steve Sather was officially named president and chief executive officer after serving since the previous August as acting CEO. In July 2014, El Loco Pollo (NASDAQ: LOCO) became a publicly traded company on NASDAQ. In October 2016, the company announced that it had teamed up with a Louisiana-based franchisee who plans to build and open two units in Lafayette, Louisiana, sometime in 2018. In the following year, the Louisiana-based franchisee announced that construction of the first Lafayette was going to start in the upcoming month with an anticipated opening in the late spring of 2018. In March 2018, Bernard Acoca replaced Steve Sather as president and chief executive officer. Acoca previously served as president of Teavana. Throughout its history, El Pollo Loco, Inc., tried at various times to expand beyond its core territories of California and the American Southwest, but all of these attempts were so far not very successful. In 1987, then owner TW Services began to open restaurants in the Orlando, Florida area, starting in Winter Park. Five restaurants were eventually built but all five were forced to close in 1991. A second expansion attempt, mainly though franchises, was started in 2006 under then-owner Trimaran Capital Partners. All of these locations were closed within six years. During this time, El Pollo Loco or its franchisees briefly operated several restaurants in metro Atlanta, and Boston, New Jersey, and in the Hampton Roads area of Virginia; these closed by 2011. The chain's franchised restaurants in the Portland, Oregon metropolitan area also closed in 2011. An El Pollo Loco in the Foxwoods Resort Casino in Connecticut closed in spring 2012. The last of four Chicago area stores closed at the end of 2012. In the U.S. as of 2018, El Pollo Loco operates over 400 company-owned and franchised restaurants in Arizona, California, Nevada, Texas, Utah, and Louisiana. In 2012, El Pollo Loco restaurants went through a major makeover. Under Denny's and its successors, El Pollo Loco, Inc., had sold franchise licenses to operators based in East Asia. In 1987, TW Services made a deal with the major Japanese trading company Mitsui & Co. to open 484 restaurants across Japan, at the same time that Taco Time and Taco Bell were opening their first locations in the country. The first of these opened in Tokyo in 1988. All of the Japanese locations closed by 1994. By 1997, EPL, Inc., had franchises located in Malaysia, Singapore, and the Philippines. The franchise licenses for both Malaysia and Singapore has since lapsed. In July 2016, the Delgado family, owners of the El Pollo Loco franchise in the Philippines, filed a lawsuit against EPL, Inc. in the Regional Trial Court so it could retain the El Pollo Loco trademark in that country after the franchise contract had terminated. The brand created Fire-Grilled Fundraisers, an initiative for nonprofit organizations to raise funds for their cause while dining at the restaurant. They also created El Pollo Loco Charities, a nonprofit 501(c) charity to provide meals to underprivileged families, in 2005. At least one El Pollo Loco franchise has actively recruited members of the local transgender community to become a part of their workforce. ^ "Full List of Locations". El Pollo Loco. Retrieved 23 November 2015. ^ Luna, Nancy (Mar 26, 2019). "El Pollo Loco names former Starbucks executive COO". Nation's Restaurant News. Retrieved March 27, 2019. ^ "Franchising Overview". El Pollo Loco Inc. January 12, 2019. ^ "Our Food". El Pollo Loco Inc.
^ Luna, Nancy (September 2, 2016). "El Pollo Loco adds fried chicken tenders as Raising Cane's leads surge in chicken sales". Orange County Register. ^ "El Pollo Loco Introduces New Chicken Tenders". Brand Eating. September 5, 2016. ^ "The Legacy of El Pollo Loco". El Pollo Loco. Archived from the original on 2010-11-25. ^ "Saboreando el éxito" [Savouring success]. Revista Clase (in Spanish). June 24, 2015. ^ a b c Moreland, Pamela (February 12, 1982). "Mexico's Crazy Chicken Is Set to Take on Colonel". Los Angeles Times. p. F1. Alternate Link(subscription required) via ProQuest. ^ "The Denny's Inc. restaurant chain has reached an agreement..." United Press International. September 19, 1983. ^ Rivera, Nancy (March 10, 1985). "El Pollo Loco Adopts Yuppie Look but Still Maintains Its Latin Flavor". Los Angeles Times. ^ "TW Services To Get Denny's". The New York Times. July 17, 1987. ^ Sanchez, Jesus (July 17, 1987). "N.Y. Firm Buys Denny's Chain for $218 Million : Most of Top Management Will Remain With Chain". Los Angeles Times. ^ "Retail". Los Angeles Times (Orange County ed.). May 3, 1990. p. 5. El Pollo Loco is about to open its 200th store. The "store of significance," as the company calls it, is situated on Yorba Linda Boulevard in Yorba Linda and opens Wednesday. Alternate Link(subscription required) via ProQuest. ^ Sullivan, J. L. (June 6, 1994). "Becoming a tough bird: El Pollo Loco regroups, steps up marketing effort". Orange County Business Journal. 17 (23). p. 1. A side-dish bar and salsa bar are in test periods at several locations. El Pollo Loco executives are currently testing a barbecue concept, as well as a joint operation with a Fosters Freeze store in Upland, Calif., a project that might lead to the introduction of ice creams chainwide. Also rolling into the chain's locations are french fries, which executives hope will round out their selection and remove a possible objection by customers considering a meal out. Link(subscription required) via ProQuest. ^ a b Monson, Rani Cher (February 16, 1995). "El Pollo Loco will open more outlets, boost menu, remodel". Orange County Register. p. c.02. The Irvine-based fast-food chain has other plans, too. For starters, $6.6 million will be spent to remodel all 206 El Pollo Loco locations. Changes include an exterior overhaul, installing new lamps and adding salsa bars at every location. The goal is to finish the job systemwide by 1996. Also, the company might expand a recent experiment in catering and home delivery. The company says the services were so popular during the holidays that the idea might go chainwide. All 31 Orange County locations cater, and one Huntington Beach store has home delivery. The menu, once top heavy with chicken, will get several new items, including fish tacos, mashed potatoes and cucumber salad. Six entrees and five side dishes were added last year, helping to boost the company's sales. Link(subscription required) via ProQuest. ^ Eyerly, Alan (August 1, 1995). "That's a Wrap--Charity Event Is Full of Beans". Los Angeles Times. ^ Johnson, Greg (December 9, 1995). "El Pollo Loco Looks for a President, Lands a Whopper : Restaurants: New leader sees chance for chain to grow beyond its base in Western states". Los Angeles Times. ^ a b O'Dell, John (April 23, 1997). "Marchioli to Head El Pollo Loco". Los Angeles Times. ^ Hernandez, Greg (November 10, 1999). "El Pollo Loco Sold for $114 Million". Los Angeles Times. ^ Vincent, Roger (September 29, 2005). "El Pollo Loco to Be Sold for $400 Million". Los Angeles Times. ^ Luna, Nancy (September 29, 2005). "El Pollo Loco to be sold". Orange County Register. ^ Reckard, E. Scott (April 11, 2001). "Fast-Food Veteran to Head Up El Pollo Loco". Los Angeles Times. ^ "El Pollo Loco is Newest 'Recruit' on NBC's The Apprentice: Los Angeles". Business Wire (Press release). 28 January 2007. Retrieved 10 October 2013. ^ Bond, Rob (July 6, 2010). "Top 26 Franchises for Hispanics: Poder's annual survey of Hispanic diversity in the franchise business sector in 2010". World Franchising Network. ^ "El Pollo Loco plans to open 1st Utah restaurant in May". Deseret News. January 24, 2008. ^ a b Wells, Shannon (15 July 2008). "Restaurant spices up Wood Village Town Center". Portland Tribune. ^ a b "El Pollo Loco Opens 400th Restaurant in Chelsea, its First Boston Area Location Experienced Multi-Unit Restaurateurs Open Third of at Least 25 New Eng". Multi-Unit Franchisee Magazine. May 27, 2008. ^ "El Pollo Loco CEO flies the coop for Red Robin job". QSR Web. August 12, 2010. ^ Luna, Nancy (January 18, 2011). "El Pollo Loco taps ex-doughnut leader as CEO". Orange County Register. ^ Li, Shan (July 25, 2014). "El Pollo Loco stock sizzles to close at 60% above IPO price". Los Angeles Times. ^ Luna, Nancy (July 25, 2014). "Wall Street clamors for a taste of chicken: El Pollo Loco stock surges 60 percent on first day of trading". Orange County Register. ^ a b "Two El Pollo Loco locations planned for Lafayette". Baton Rouge Advocate. October 3, 2016. ^ "Former Starbucks Exec Bernard Acoca Named CEO of El Pollo Loco". QSR Magazine. February 28, 2018. ^ Snyder, Jack (July 13, 1987). "Real Estate". Orlando Sentinel. p. 6. Alternate Link(subscription required) via ProQuest. ^ Strother, Susan G. (October 19, 1991). "El Pollo Loco Closes Orlando Restaurants". Orlando Sentinel. ^ Hirsch, Jerry (November 28, 2006). "Will East Coast go loco for an expanding El Pollo? : The Mexican chicken chain has ambitious plans to compete nationally but faces a challenge in taco-deprived New England". Los Angeles Times. ^ "El Pollo Loco Heats up National Expansion with Multiple Franchise Development Agreements: Flame-Grilled Chicken Leader Signs Agreements for 61 New Locations in Five Key States". Business Wire (Press release). November 6, 2006. ^ "El Pollo Loco plans eastward expansion". L.A. Biz. January 28, 2004. ^ "El Pollo Loco Leaves Atlanta as Other Chains Make a Comeback". Tomorrow's News Today - Atlanta. October 5, 2011. ^ "El Pollo Loco in Chelsea Has Closed". Boston Restaurant Talk. January 14, 2010. ^ Verdon, Joan (May 3, 2012). "Latin-flavor chicken chains haven't migrated to North Jersey in expected numbers". NorthJersey.com. ^ Shapiro, Carolyn (February 17, 2011). "3 El Pollo Loco restaurants closing". Virginia Pilot. ^ Gunderson, Laura (April 4, 2009). "Fast-food chains look toward growth in Portland market". The Oregonian. ^ Giuca, Linda (November 23, 2006). "Take On A Chicken In A Game Of Tic-tac-toe". Hartford Courant. ^ Fulmer, Melinda (February 4, 2004). "El Pollo Loco to Expand to Chicago Area". Los Angeles Times. ^ Meyer, Gregory (August 4, 2005). "El Pollo Loco's Hombre in Chicago". Crain's Chicago Business. ^ "El Pollo Loco pulls back on Chicago expansion". QSR Web. January 21, 2010. ^ "El Pollo Loco to Enter Louisiana with New Franchise Partner". October 3, 2016. ^ Wyatt, Megan (August 31, 2017). "Mexican restaurant to open 1st Louisiana location in Lafayette". ^ Luna, Nancy (November 8, 2012). "El Pollo Loco joins fray of fast food makeovers". Orange County Register. Retrieved 10 October 2013. ^ Galante, Mary Ann (July 22, 1988). "Taco Bell Hopes Japan Says Si to Mexican Fare". Los Angeles Times. Retrieved September 15, 2018. ^ "Taco Time chain announces expansion into Japan". Eugene Register-Guard. May 3, 1987. Retrieved September 15, 2018 – via Google News. ^ "TW Services expands El Pollo Loco to Japan". UPI Archives. November 17, 1987. Retrieved September 15, 2018. ^ Martin, Richard (February 14, 1994). "Japan: Opportunities exist despite crowded market". Nation's Restaurant News. 28 (7). p. 4 – via ProQuest. The pressures have proved too much for some chains that made hopeful debuts in the last five years but recently have bailed out of Japan. Unable to crack the market despite the clout of strong Japanese partners, both the Carl's Jr. and El Pollo Loco chains have thrown in the towel. ^ Agustin, Victor C. (July 8, 2016). "Cocktales: El Pollo Loco breaks away from US parent over trademark issue". InterAksyon. Archived from the original on 2016-09-17. ^ "El Pollo Loco Seeks to Boost Impact on Community through Non-Profit Charity". Bison Advertising. April 18, 2005. ^ Honigman, Brian (November 3, 2016). "How Franchisor Michaela Mendelsohn Launched A Hiring Program For Transgender Professionals". Forbes. ^ "California Restaurants Launch Nation's First Transgender Jobs Program". NPR. October 19, 2016. ^ Cosgrove, Jaclyn (March 23, 2018). "An El Pollo Loco franchisee got an early start on running her own business". Los Angeles Times. This page was last edited on 23 April 2019, at 08:44 (UTC).